Rosenstiel is with the group National Popular Vote. The group advocates the National Popular Vote bill, which “would guarantee the Presidency to the candidate who receives the most popular votes nationwide (i.e., all 50 states and the District of Columbia). “It has been enacted into law in 11 states with 165 electoral votes, and will take effect when enacted by states with 105 more electoral votes.” See the status of the National Popular Vote bill in each state. The group argues that “State winner-take-all laws are the reason why the vast majority of voters and states are not in play in presidential campaigns.” See video from the group on the constitutionality of the National Popular vote. 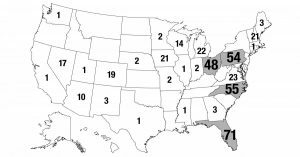 It notes that states did not originally allocate their electors in a winner-take-all manner. Rather, this practice began proliferating in 1800 because of the rivalry between Virginia and Massachusetts.